SOLiD Technologies is launching the TITAN™ 20W Remote Unit and the ACCESS-GT™ Small Cell Backhaul and WiFi Offload solution at CTIA Wireless 2012 in booth number 4461. Together, TITAN and ACCESS address the challenges Building Owners and Wireless Service Providers increasingly seek from Distributed Antenna System (DAS) solutions: high-capacity Outdoor DAS coverage and reduced cellular network costs. SOLiD will also be demonstrating the best-in-class ALLIANCE™ multi-service DAS and the single operator EXPRESS™ DAS which features the industry’s fastest and easiest commissioning system with EasySET™. The new TITAN™ 20W Remote Unit integrates with the ALLIANCE or EXPRESS head-end to provide expanded coverage area and capacity for highly-trafficked applications such as professional sports venues, metropolitan subways and campuses. As with other SOLiD solutions, TITAN makes highly-efficient use of fiber. The powerful yet compact and rugged design is ideal for high-capacity venue applications. ACCESS reduces Small Cell Backhaul and WiFi Offload costs by multiplexing 16 channels of high-capacity broadband per strand of fiber. ACCESS eliminates the need to pull new fiber which can be both financially and physically challenging. The patented tunable laser technology costs a fraction of competing laser solutions and automatically commissions the fiber network to virtually eliminate the need for manual configurations, truck rolls or specialized training. To learn more about SOLiD DAS solutions, please visit the website and subscribe to the SOLiD blog, The Inside Story, for the latest information on industry trends. SOLiD Technologies is the U.S. operating arm of SOLiD, Inc., a publicly-traded global telecom manufacturer established in 1998. SOLiD enables greater coverage and capacity for wireless and wireline telecommunications providers with innovative, patented and robust fiber technology solutions. SOLiD's distributed antenna system (DAS) solutions ensure dependable coverage within buildings, campuses and venues. 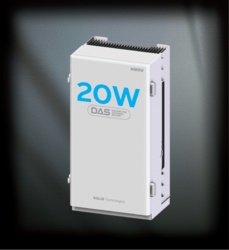 The Company's flagship DAS solution - ALLIANCE™ - delivers best-in-class multi-carrier DAS performance and efficiency with support of commercial wireless, public safety radio, private 2-way radio, and paging on a single DAS infrastructure using just one strand of fiber. SOLiD’s optical multiplexing solutions, based on patented GT™ tunable laser technology, create economies of scale to provide significant savings for small cell backhaul and WiFi offload. With innovation as part of its DNA, SOLiD is applying its technology to solve not only today's challenges but leading the development of next-generation solutions. SOLiD’s global customer reach includes major wireless operators, Tier-1 and facilities-based carriers as well as leading hospitals, world-class hotels and resorts, Fortune 500 corporate campuses, international airports, professional sports venues, metropolitan subways and other marquee customer sites. SOLiD is available on the GSA Schedule. For further information please email info(at)solidtechusa(dot)com or call 888-409-9997.